This article is about the TCG Structure Deck. For the OCG Structure Deck, see Structure Deck: Devil's Gate. 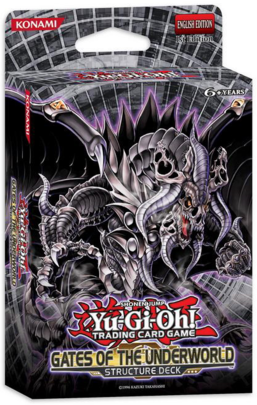 Gates of the Underworld Structure Deck is a Structure Deck in the Yu-Gi-Oh! Trading Card Game (TCG). It is the twentieth deck in the TCG's Structure Deck series, following Lost Sanctuary Structure Deck. This deck is the TCG equivalent of Structure Deck: Devil's Gate in the OCG. The deck features the Fiend-Type Theme. It is a Fiend-Type Deck based on using the "Dark World" Monsters; it includes 5 new cards and many reprints. This page was last edited on 3 July 2016, at 13:29.